I have a question in terms of burning bootloader into pixracer. Pixracer has reserved a jtag port, which has 6 pins. I want to burn bootloader into it, but I do not know what kind of jtag dongle is needed to achieve this purpose. In my opinion, jtag dongle is 10-pin not 6-pin. How should I use the reserved 6-pin port. I am new to this, any suggestion is appreciated. Thanks. 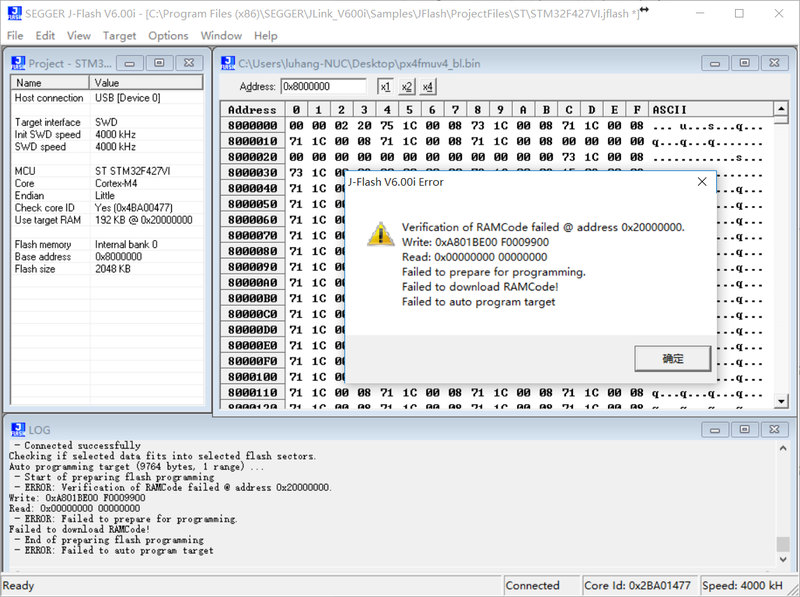 pixracer's debug port is composed of SWD and UART5. So you do not need both of the 6pin, only 3 of them will work, if you use a SWD interface: SWDIO, SWDCLK, and GND. If you have a Jlink hardware, just connect above three wire, and you can use J-Flash to burn the bootloader. Thanks for the quick reply. That helps a lot. I looked into pixracer schematic, and found the port is composed of SWD and UART7, not 5. You mentioned 3 wires should be enough, but how about VDD (3.3V)? Is it necessary to be connected while using jlink? I guess you say UART7 should be USART7, which is the label of 427 scheme. However from a pixhawk/pixracer board level it is usually usually numbered as UART5 or serial5. VDD is optional, depending on how you power your JLink. if VDD is not connected, you can just power your pixracer from usb separately. Oh, thanks for the clarification. I will try as you say. It always informs that verification of RAMCode failed @ some address. Any ideas? We did not solder that 10K resistor. Is it possible that it causes this problem? If yes, how boot0 and boot1 should be handled (to GND, VCC?). Thanks. I have figured that out. Anyone wants to know. Feel free to contact me. Can you explain what how you figure out please? NRST is pin number 14 of the MCU. I'm new to jtag programming and have yet to learn a lot. Yeap. Sorry for this late. Maybe you have figured it out. NRST must be connected to VCC, as I recall, or the MCU will always be reset. Please also verify this connection in the manual for double check. You should wire at the FMU port. The FMU microcontroller is where the PX4 firmware runs. The IO microcontroller it could be used to control motors or for FC for example.